1. Any cavity or enclosed space serving as a reservoir, especially for chyle, lymph, or cerebrospinal fluid. 2. An ultramicroscopic space occurring between the membranes of the flattened sacs of the endoplasmic reticulum, the Golgi complex, or the two membranes of the nuclear envelope. /cis·ter·na/ (sis-ter´nah) pl. cister´nae [L.] cistern. cisterna cerebellomedulla´ris poste´rior posterior cerebellomedullary cistern; the enlarged subarachnoid space between the undersurface of the cerebellum and the posterior surface of the medulla oblongata. cisterna chy´li the dilated part of the thoracic duct at its origin in the lumbar region. perinuclear cisterna the space separating the inner from the outer nuclear membrane. a cavity that serves as a reservoir for lymph or other body fluids. Kinds of cisternae include cisterna chyli and cisterna subarachnoidea. An enclosed space acting as a fluid reservoir. The cisterna magna is a space filled with cerebrospinal fluid lying between the CEREBELLUM and the MEDULLA OBLONGATA. (pl. cisternae) a cellular space enclosed by a membrane, as in the GOLGI APPARATUS and the ENDOPLASMIC RETICULUM of cells, and the arachnoid space in the brain. When stratified by gender, male fetuses characteristically have higher frequency of isolated MCM compared to female fetuses and the mean measurements of the cisterna magna appear to be larger for males8. Clinical significance of isolated mega cisterna magna is not clear and most of the studies have reported a good prognosis. Clinical significance of isolated enlargement of the cisterna magna on prenatal sonography. The cisterna magna occupies a large space in the brain where CSF can be collected, or medication administered for intrathecal infusion; [sup], however, the distance from skin to the cistern and depth of cisterna magna varies by gender, weight and age. In this study, significant gender differences were seen in the distance from the skin to cisterna magna, this result is similar to Zhao et al . Serious complications such as laceration of the cerebellar artery by sub-occipital puncture of the cisterna magna, may ensue if the direction of the needle is inappropriate. Therefore, the depth from the skin to the cisterna magna might differ from radiological studies to the clinical setting. La construccion de una cisterna lleva en promedio 5 dias, en la gran mayoria de las veces contando con la ayuda de la propia familia y de los vecinos. Los problemas presentados se derivan de: uso de material de mala calidad, tecnicas inadecuadas de construccion; uso no adecuado de material para el tipo de suelo; falta de cuidados especiales de mantenimiento, como no dejar la cisterna vacia y construccion de las cisternas proxima a los arboles. De las 34 familias entrevistadas, 23 (68%) poseen mujeres como responsables por la cisterna. 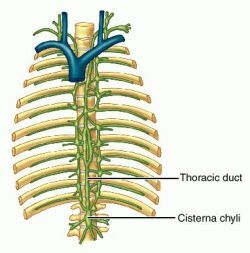 According to Jossifow (1905), the cisterna chyli may be largely dilated lumbar trunk or an anastomotic network or may be a derivative of the lumbar trunk, which pierces the right crus of the diaphragm.